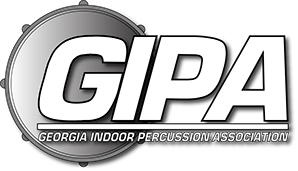 Welcome to the home of The Georgia Indoor Percussion Association. We are very excited to begin supporting and growing the percussion activity in the state and surrounding areas. GIPA is an all volunteer nonprofit public benefit corporation and is not organized for the private gain of any person, or persons, or ensemble. Our purpose of this corporation is to promote the growth of the percussive arts through competition, performance and educational activities and to encourage goodwill, good sportsmanship and camaraderie through such activities. GIPA is being patterned after the most successful and respected percussion circuits from around the country, and is built from the ground up to serve the needs of percussion performers, and instructors. GIPA will offer an environment that fosters growth on every scale of percussion from A class to World class and everything in between. -A WGI format specific to percussion and it’s unique needs adhering strictly to the WGI rule book. -Two performance opportunities for ensembles at all seasonal events in a Prelims and Finals format. Giving ensembles a much better return on the time and money invested by the performers and instructional staff, and allowing groups to gain double the experience performing. -World Class judges both local and regionally that not only have the best training, but practical experience in the indoor activity. -No Scheduling conflicts with WGI Regionals or WGI Championships. We will also be vigilant in our scheduling to avoid as many conflicts as possible with local music education events and festivals. -Venues that will support the needs and requirements specific to the percussion activity. This is just the beginning. We will be a circuit that will evolve with the needs of the ensembles in the area. As such, we will be holding an informational meeting for all interested directors and staff on Sept 7th(location TBD). We will answer any questions, and be open to ideas to make this circuit as effective as possible. Georgia is home to some of the best music education programs in the country. We will be a percussion circuit equal in quality and educationally standards to the great work already being done in the community. Please join us on Sept 7th as we beginning the exciting new era in the Georgia percussion community. If you can’t attend the meeting but still want information about participating in GIPA please don’t hesitate to email us. Sign up for the GIPA newsletter.